The maggots had a sweet treat on April 9! 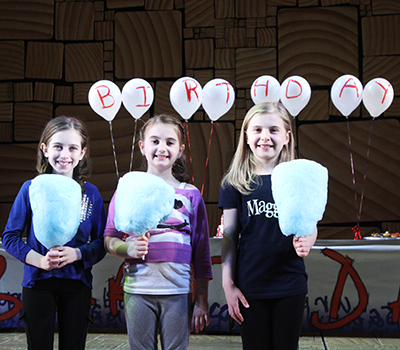 The cast of the hit musical celebrated a very important milestone: Matilda’s second Broadway birthday. The adaptation Roald Dahl’s beloved book originally opened March 4, 2015 at the Shubert Theatre, and the “Revolting Children” are still running wild! Check out these Hot Shots of stars Tori Feinstein, Eliza Hollan Madore and Brooklyn Shuck at the the onstage cotton candy party in honor of the musical’s second anniversary, then see Matilda the Musical on Broadway.